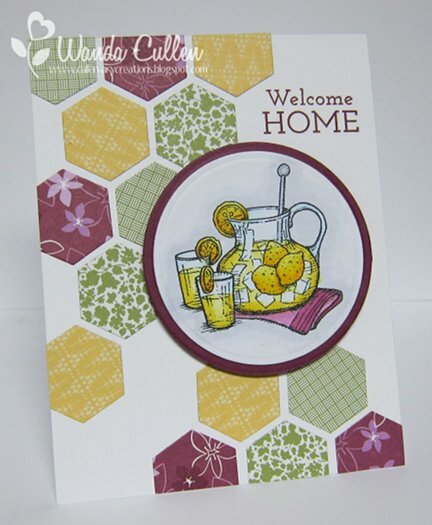 I'm back with another hexagon themed card...thanks to the Moxie Fab Tuesday Trigger inspiration photo that you see on the left! I had quite a few leftover hexagon shapes from my card for the color challenge on Tuesday on SCS, so I kept it clean and simple...one layer only. The sentiment is a new Plain Jane from Verve's latest release and I couldn't resist some faux cross stitching - a stamp from Verve's new "Borderline" set. After paper piecing the cupcake base, I added yellow Stickles to the star and White Opal Liquid Pearls to the "icing". The cupcake is from another new Verve set called "With Love". 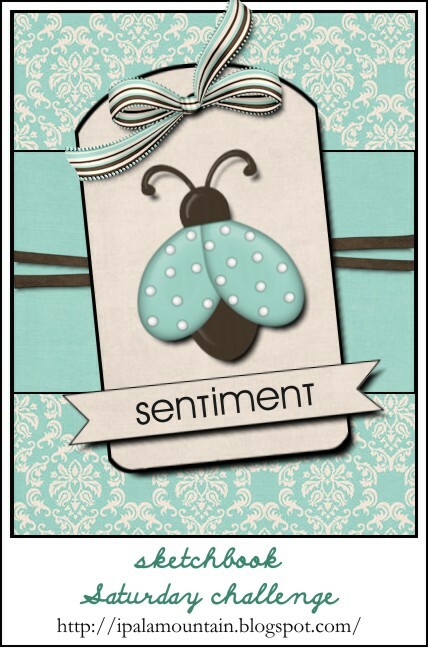 Julee Tilman, Verve owner, has released so many wonderful new images and dies...you will want them all! Check out the Verve store HERE! This is also for the Free 4 All challenge to create a birthday card. The banner and hexagon dies are from My Favorite Things. PAPER: DP by SU, Rich Razzleberry (SU), White (PTI). Here's a second post for the day...am procrastinating housework until tomorrow. 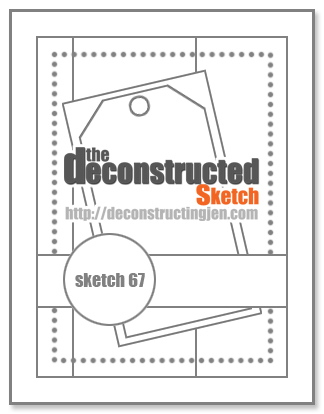 :-( Couldn't resist Jen Shultz' Deconstructed Sketch Challenge for my layout and I'm also playing along with Hannah's Ways to Use It challenge on SCS to use a "smile" theme. I think I got the theme idea a bit reversed with my sentiment, but it is what it is. Challenge police will have to come after me! 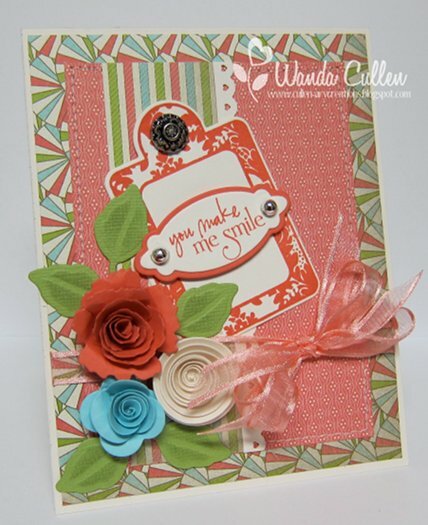 ACCESSORIES: Rose, Circle and Scallop rose Die-namics by MFT, Sheer ribbon, Antique brad (SU), Tagged Rectangle die and Charming Oval die by Verve, Silver pearls, Foliage die by SB, Heart scallop border punch by MS.
...the passion flower to be exact! I can't believe I haven't taken time to ink up this gorgeous new bloom from Flourishes, but when I saw Denise's Timeless Tuesday Challenge was to use blue and purple together...I knew it was time this image saw some ink! I colored with Copics on X-Press It Blending Card, then fussy cut around the edges and added a sheer ribbon bow. COPICS: YG21, YG25, YG17, B60, B63, B66, C00, C3. Thanks for stopping by...I had my play time, so now it's off to get some cleaning done! 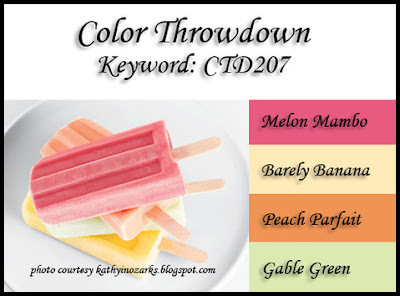 Lori has some some fun, summery colors for this week's Color Throwdown Challenge! 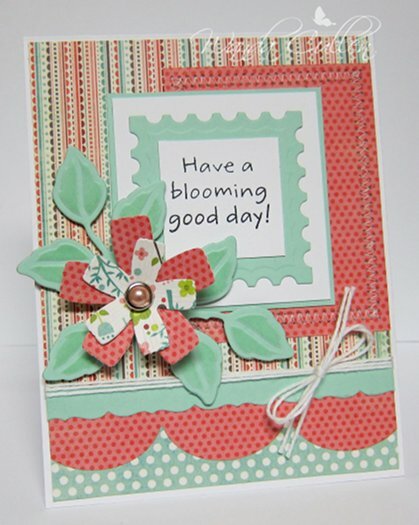 The chevron border and blossom die layer are papers from the "Citronella" 12x12 pad by K&Co. They will definitely wake you up - lol! I used Melon Mambo CS for the rosette. 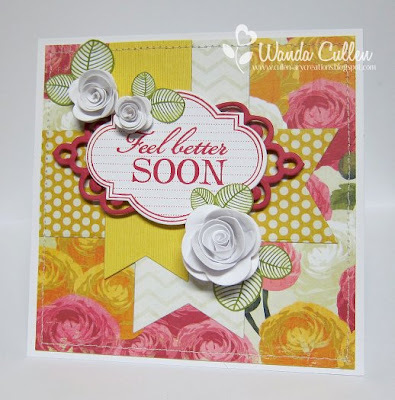 The CAS design is following Mona Pendleton's sketch for this week's Waltzingmouse Sketch Challenge. I popped the leaves and flower on foam dots to give more dimension. Barbara Anders, Broni Holcombe, Denise Marzec, Joan Ervin, Kerri Michaud, Lori Tecler, Lynn Put, Tammy Hershberger, Vickie Zimmer (August Guest Designer). ACCESSORIES: English Ivy border stamp by EK Success, Blossom Nestie, Rosette die by Tim Holtz, Leaves die by Sizzix, Button, Satin ribbon. 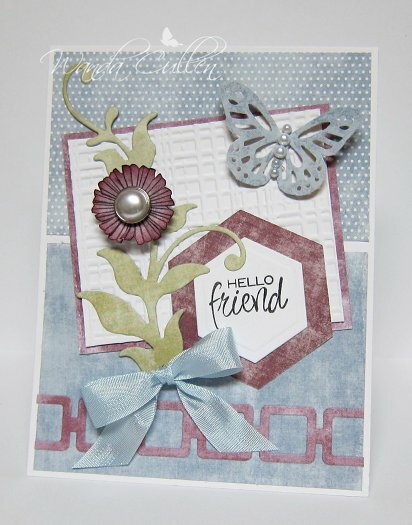 ACCESSORIES: Circle Nesties, Hexagon Die-Namics by MFT, Copics. It's the last Monday of the month, so that means a circle or square card for the Mojo Monday sketch challenge. I really loved the layered flags in this layout and decided to play with some new papers from the "Honey" pad by My Mind's Eye. Lots of color going on with this 5 1/4" square card! I die-cut the flags using MFT's Fish Tail Flags STAX Die-Namics and the mini rolled roses are also MFT Die-namics. The leaves are from Verve's "Sunny Days" set...stamped in Old Olive...then color was "dragged into" the leaves using an Aquapainter pen. 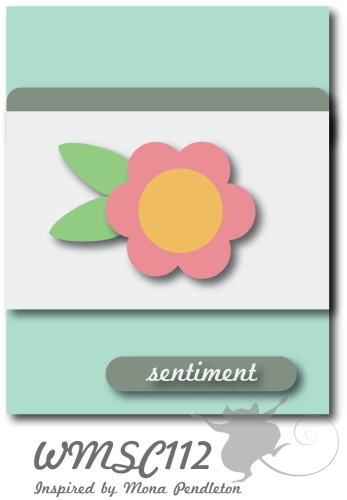 The Plain Jane sentiment was stamped in Rose Red over a Classy Label Die by Verve (border stamp from Verve's "Love Notes" set). The label was then layered over a Fancy Tags Two die by Spellbinders. So, get your mojo going and join us! You'll want to upload your creation to the Mojo Monday blog and don't forget to check out what the other mojomakers have created! Owl Be! Mary is FS! 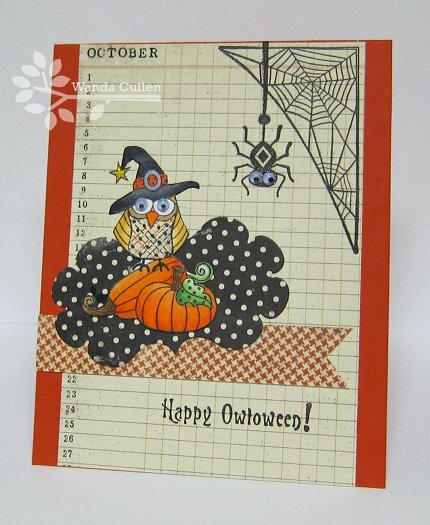 I had just picked this stamp set up yesterday while shopping at Mike's and knew after I saw the Featured Stamper's gallery on SCS that I wanted to ink up this owl image. Mary, aka jandjccc, has a wonderful gallery and has a number of owl cards in it, so that's what inspired me. I don't own the owl punch she used, so I opted to paper piece the owl "vest" instead. I colored with Copics, fussy cut, then added yellow Stickles to the star and 4mm googlie eyes to the owl and spider. The layout is for Chupa's Sketchbook Saturday Challenge #74. Y21, Y26, N1 - owl. Good morning friends! I created this card for the MFT Wednesday Sketch Challenge in the SCS forum and got to use some MME paper that I found at TJ Maxx for $2.99/pad! Woohoo...love those bargains! 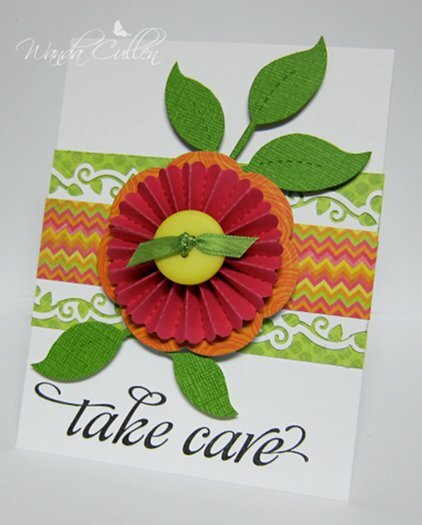 I also loved this sketch and decided to just go with the sentiment from the Blooming Good Day PI set and highlighted it with MFT's fringed perennial flower. I tucked in some leaves made using a Spellbinders' foliage die. I dug into my SU retired papers and used Mint Melody CS sponged with Mint Melody ink - now that's a blast from the past! 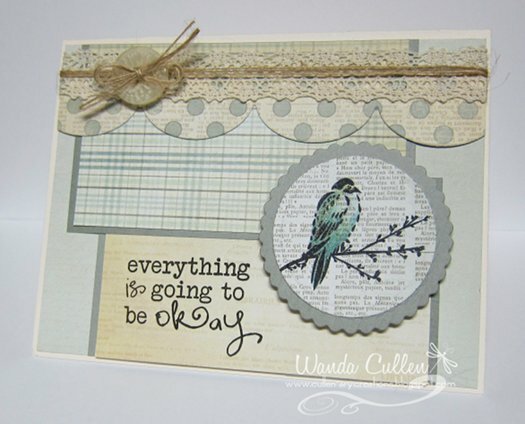 ACCESSORIES: Postage Stamp Nestie, Fringed Perennial Die-Namic (MFT), Foliage die (SB), Brad, Large scallop and ? name border Die-Namics (MFT), White twine (SU). Here's hoping each one of you has a blooming good day! ACCESSORIES: Labels Four Nesties, Die-Namics Fish Tails Flags STAX by MFT, Classic Keyhole template die by Flourishes, Copics, Certainly Celery twill ribbon by SU, Kassies' Brocade EF, Rhinestones, Copics. Life has been too full for me to participate in any of Chupa's festivities for her 2nd anniversary celebration of the CASE study challenge blog, but I'm about to change that status! The current challenge is to be inspired by one of the design team members - past or present. Wow! Where to begin?! 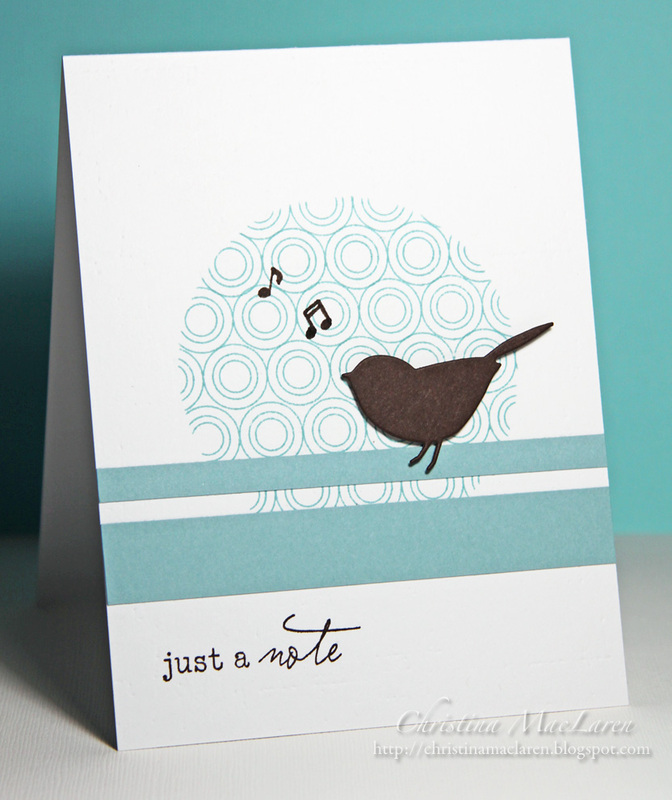 I'm challenging myself to create more CAS cards and Christina MacLaren, a present DT member, rocks that style! I chose the card to the right to CASE. 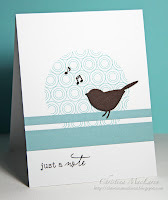 I used the negative cut from a circle Nestie as a stencil and stamped the script BG. I colored the frog with YG11, YG13, YG17 Copics and filled in the hearts with red Stickles. 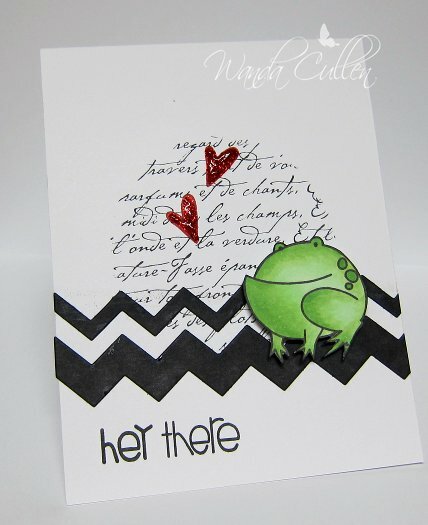 I used MFT's chevron Die-Namics for the border. 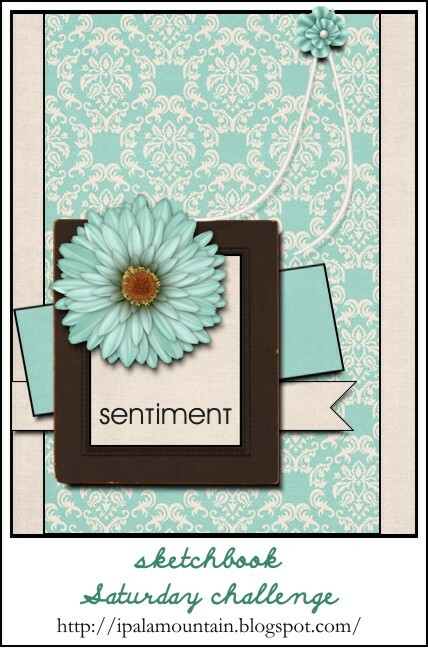 STAMPS: A Little Lovin' by Paper Smooches; Sentiment Sampler by Paper Smooches; French Script BG by SU. Good Monday morning everyone! 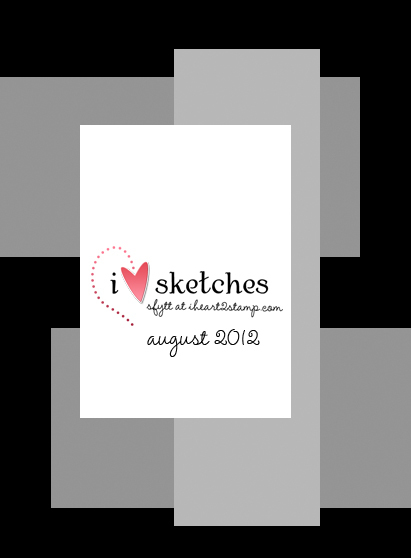 Another week has rolled around and this time, Teresa Kline has given us a great sketch for the Mojo Monday challenge! I decided to flip the layout since I wanted to use this Plain Jane sentiment. The colors are very muted and out of my norm, but love the serenity that they reflect. I colored the bird with Copics (BG70 and BG72) then highlighted it with a Mint Spica pen. Be sure to head on over to the Mojo Monday blog and see what the rest of the mojomakers have created! 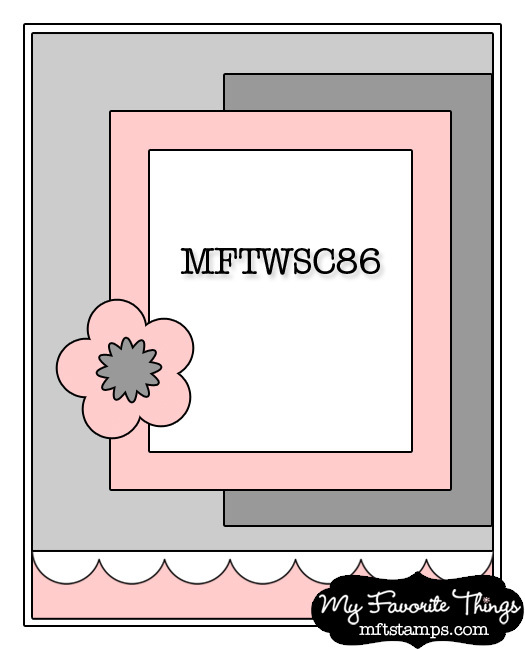 If you upload your card to a public gallery, be sure to use the keyword MOJO255. Can't wait to see what you create! ACCESSORIES: Circle Nesties, Large scallop border Die-Namics by MFT, Jute twine, Button by SU, Lace, Copics, Mint Spica pen. 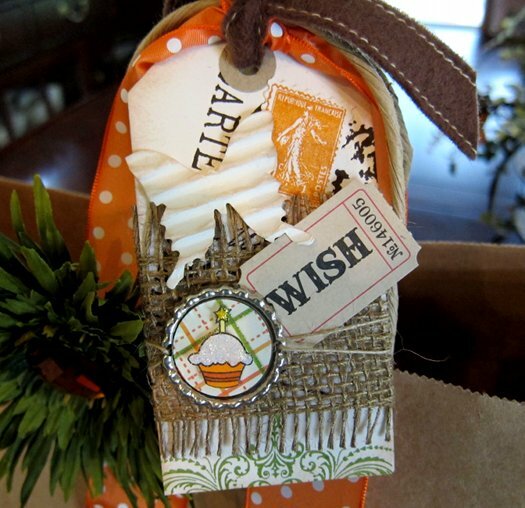 Another quick post of a gift tag I created for a dear friend's birthday. I flattened a bottle cap (purchased at Michael's) by running it through the Big Shot (a tutorial for the process using a Cuttlebug is found HERE). The corrugated butterfly is from the Funkie Junkie store (a freebie with my last order) and the ticket as well as the BG stamps are by Tim Holtz. The teeny cupcake is from Verve's Birthday Bash set...colored with Copics, cut out, popped with foam dot then Diamond Stickles added to the icing and Yellow Stickles added to the wee star. 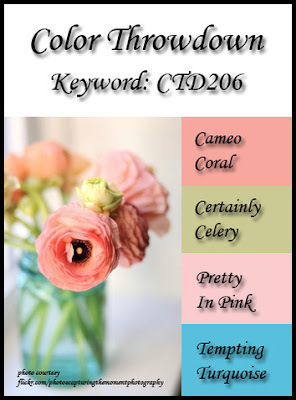 The flower is a clip-on embellishment found at Michael's. Hello peeps! It's Friday and a day off for me! Had to start it off with a bit of stamping...this is for Amy and Janelle's challenge in the Verve forum to celebrate Verve's birthday #5! 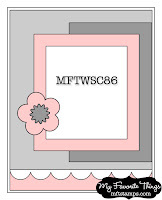 I used the purse box template that you can find in my Tips/Tutorial tab at the top of my blog. 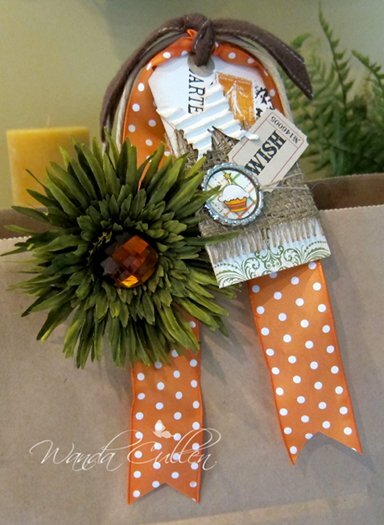 ACCESSORIES: Leafy sprigs and Ribbon banner dies by Verve, Button, Jute twine, Template, Rhinestones. Today is the 4th day of celebration in the Verve forum on SCS and it's a CAS challenge! I had so much fun putting this together! 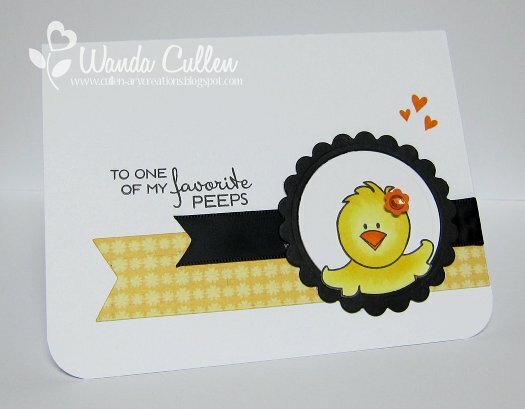 I jazzed up the peep with a little punched flower and rhinestone and she was colored with Copics. COPICS: Y11, Y13, Y15, YR16, YR18. This is the 3rd day of celebration in the Verve forum on SCS! Julee and Laurie have this wonderful sketch for us and I also played along with the CR84FN Color Challenge where I used the more muted tones of the 3 colors. Thanks so much for stopping by! Love to read your feedback on my creations! Happy hump day! 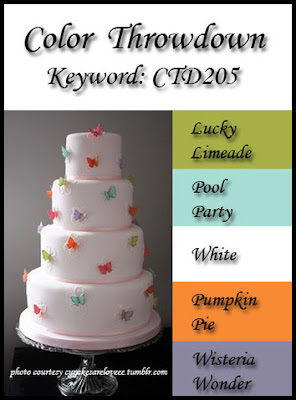 It's time for another Color Throwdown Challenge and Joan has a fun combo...thanks to the inspiration of this yummy cake! My first card was a total flop, so I scrapped the DP I started with and went with creating my own hexagon borders....ahh...much better. :-) Pretty straight forward with no fancy stuff going on here. ACCESSORIES: Rosy Posy dies by PTI, Orange satin ribbon, Foam tape. Here's hoping you can join us! You don't need exact colors...anything close will do. You'll want to check out the other design team members' cards for inspiration - along with our super talented guestie, Vickie Zimmer! Don't forget to use the keyword CTD205 if you upload to a public gallery. Ahoy there! This ship might look small and innocent, but it's home to the biggest, baddest pirate ever - lol! It's been awhile since I've attended one of Mothermark's tea parties and when I saw the destination station was a young boy who loves pirates, I knew I wanted to use this Verve stamp set! Check out all the details for the Teapot Tuesday challenge and join us in sending some cheer to James in Champaign, IL. 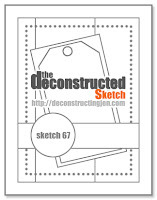 I used Jen Del Muro's Sketch For You To Try and kept the card pretty clean and simple. With the "wood" BG paper, this qualifies for the 2nd challenge in the daily celebration going on in the Verve forum on SCS where they are celebrating Verve's 5th year of business. Lots of new goodies will be released on August 24 and you can see sneak peeks on the divas' samples. 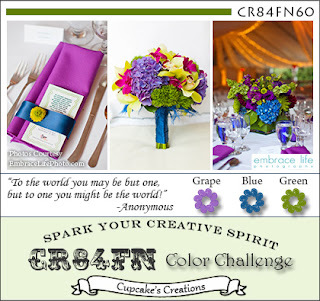 For more details with Maureen's challenge, please check it out HERE. I used Vicki's colors for the SCS Color Challenge: Tempting Turquoise, Night of Navy, White. 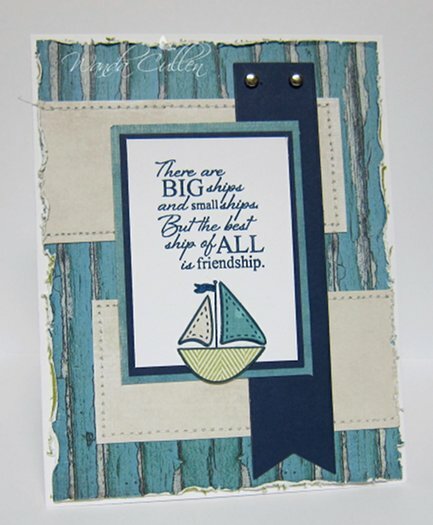 ACCESSORIES: Silver brads, Distressing tool, Die-Namics Fishtails Flags STAX by MFT. Labels: SFYTT, Teapot Tuesday, Verve.